Today’s blog post is a part of a two-part series and is all about writing papers in college. I have been grading a lot of papers lately, and this has given me some valuable insight into things that college students do while writing papers (as well as making me think about all the things that I do while writing my papers.) Being a graduate assistant has really opened my eyes as a writer and made me think about what I could be doing to write better papers. 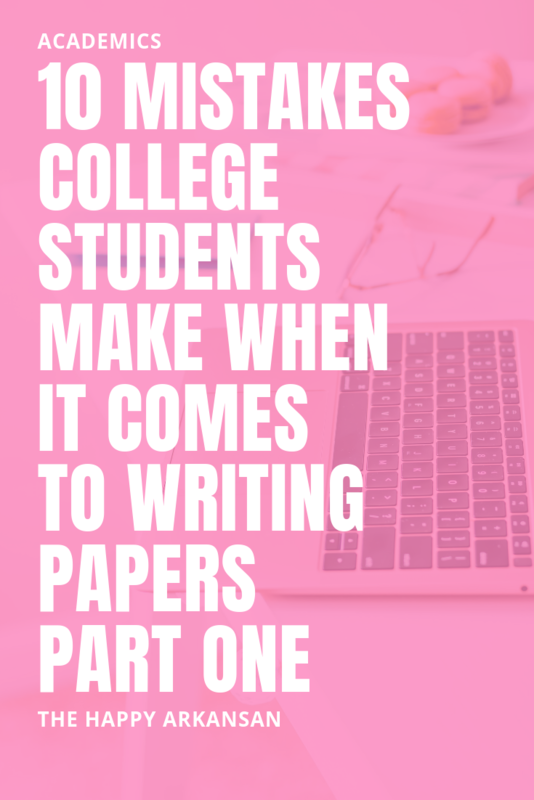 Today on the blog I am going to be sharing five of the ten mistakes that college students make when it comes to writing papers in college. You need to start your paper early enough so that you have a decent amount of time to work with it, fix it, and perfect it. As a college student (and a graduate student) I like to procrastinate. I am not going to lie to you as if I have everything figured out. Together we have to strive to stop this bad habit. Writing a paper is a process, and it should be treated as such. Writing your paper in smaller chunks instead of 10 pages at a time in two days will work so much better for you. Stop stressing out by giving yourself time to work on your paper. When you first receive a paper prompt, come up with a plan. Make sure you know when your paper is due, and make it due in your planner a few days before that date. Writing down the due date early helps you have time to read it and revise it. If this is a bigger paper project break it down even further. What sections do you need in your paper? Break it down, so your article has steps. The best advice that I can give to students who want to write a great paper is to start. Starting will help you, because once you get started, it will be difficult to stop. We often dread beginning and that is the only thing that is preventing us from finishing. You have to will yourself to stop procrastinating and write the opening paragraph or the outline of a paper. This seems simple, and perhaps it is. Sometimes we avoid the simplest solution. Professors are honestly the worst at this, especially in the liberal arts. Papers have to be vague enough to catch your attention, but they also should be close-ended enough to make decisions about the article easier. If you are having issues picking a topic, talk with your professor about the paper and throw some topic ideas their way. They will help you select your topic idea if you let them know you are struggling and give them a place to start. What are you interested in studying? What can you see yourself talking about for the length of the paper topic? Check out my post on this topic for even more advice on this. This could happen a lot if you are taking an upper division class outside of your department. You may not understand all the language a paper prompt is using, and if that’s the case, you need to solve this ASAP. If something isn’t quite clicking and you have used all your dictionaries and Googling abilities—ask! I promise that your professors would rather you ask and know, than not understand a topic and get points deducted for no reason. Plus, professors need to know when the language of their prompts isn’t quite right. The more they know about this, the more they can adjust their teaching to the class and their level of learning. Sources are the lifeblood of any paper in college. You need to have amazing sources so that you can create an amazing paper or literature review. How do you get great sources? You read A LOT of articles and books. I don’t think that you should read each thing word for word, in fact, I have a great article on The Happy Arkansan all about article skimming—so go check that out here. One of the awesome things I got to do while I was a graduate assistant is source check a few papers from one of the professors I was a graduate assistant for. This was an eye-opening experience for me as a graduate student because it opened up my eyes to the sources and the time it takes for a professor to make one 30-page paper. For a 30-page paper, my professor had a backlog of 18 pages of sources. Not all of those sources went into her final paper (in fact only about eight pages of those sources went into her final project.) Isn’t that crazy? As a college student (and as a graduate student) I have often heard, thought about, or asked how many sources a paper needed. Looking back at that I am sort of upset with myself. You need a backlog of sources. Some will not work out. Some will be the primary sources you use on a topic. Her situation is different because this is a paper that she wanted to be published, but any work you do in college or graduate school can be published if you work hard at it. Having your backlog of sources makes writing more comfortable. It also makes sure that you don’t have to use a bunch of awful sources because you have so many in reserve. It is better to find 40-50 sources for a 20 source paper so that you can use the best sources of the 50 you have over just finding 20 and hoping that they all work for your article. Don’t be so quick to take what they say at face value. The sooner you start critically thinking about the sources you obtain, the better prepared for graduate school you will be. One of the best things to do when you can’t find sources—is to use your sources to find sources. Your sources took a very long time to find the amazing resources they listed in the back of their papers. Utilize their time and effort to cut down on your own. During my senior year of college, I was writing a paper about education levels, and it’s effect on tolerance. One name kept popping up in the resource section of the papers I was reading about this subject: Samuel A. Stouffer. So, being the investigator I am, I took to Amazon and bought his book “Communism, Conformity and Liberties: A Cross Section of the Nation Speaks its Mind,” which talked about a lot of the issues I wanted to discuss in my paper and made a great source. Another trick that I love when it comes to finding sources is to figure out who cited your papers. Do you have a great paper but it’s from 1990, and you want something more recent? Go to Google Scholar and enter one of your great papers. Google Scholar will then show you some results, and if that paper pops up, it will have a link that says “Cited By” underneath the link to the article. Click that, and you are given a plethora of ways to sort this data. You can then go through these more updated sources and find more articles that could help you with your paper. Check out my article on how to use research databases for more information on finding sources. Properly citing your sources is very important when it comes to writing papers. One thing I learned last month as I was reviewing the sources of one of my professor’s papers is that it doesn’t happen perfectly the first time. When you are only dealing with 10-20 sources, it might be easy, but you still need to make sure you are correctly citing your sources. This may take time and energy as well as multiple revisions of your paper, but you have to do what is necessary to make sure that your papers are cited. Plagiarism follows you around like an academic STD, so check your sources and citations before you turn in a paper. Some professors are more lenient and understand simple citing errors, but better safe than sorry. I am guilty of this honestly. I hate writing citations, and often will depend on citation websites to write them. Sometimes it’s a matter of pasting them in your paper incorrectly, or not having the correct information. If you can go in and fix and format the basics correctly, that’s a good thing. I wouldn’t say don’t use citation websites at all; they can be super helpful and save a lot of time. On the other hand, make sure you check the sources that they give you for correctness. Make sure you have the right things in italics, your periods in the right place, et cetera. Do not cite last. When you are using most citing techniques you have to do some in-text citations. Citing as you go is important, because sometimes towards the end of writing a paper, we get tired of seeing the article. We don’t want to go back through and read it for the umpteenth time, and we miss important points. This can create a problem because we could end up taking ideas we got from someone else and inadvertently claiming them as our own ideas. That is plagiarism. Cite as you go so that you can make sure that you give credit where credit is due. There are many resources on campus that prove beneficial when it comes to writing your papers. The writing center is the biggest one that comes to mind, but the library and your peers can be hugely beneficial as well. The writing center on your campus is an amazing resource—especially if you are new to writing academic papers. They can help you with things such as picking a topic, editing your paper, figuring out the various citation methods, etc. The writing center often offers a wide array of opportunities to get your papers looked at. I know at my alma mater we offered in person, Skype, text message (for small things like sentence structure), email, and more as ways to get tutored on writing. The library can be so beneficial when it comes to looking for articles, books, etc. to use in your paper. They often offer classes on using your campuses article library and archives. Library workers know where to look in the library for information on certain subjects, and they can just be plain helpful when you have a problem with random things like sources. If your reference librarians can’t help directly they probably know where to point you so you can figure it out. Having a stop at your school’s library and asking the reference librarian can be a great place to start when you are looking for sources for your paper. Your peers are a great resource because they are using the same prompt to write a paper. Copying what they are doing is a no-go, but they can often be a tremendous help when writing papers. Sometimes they are helpful simply because you can lament to them about how difficult the paper is and they are in the same boat. Sometimes they are helpful if you need to find a source or figure out the directions the professor is giving you. Make sure to befriend someone in your class so that you can work together to create a great paper. This is part one in my 10 Mistakes College Students Make When It Comes To Writing Papers series. The final part will be out next Tuesday. I hope that you have learned something interesting about writing papers in college and something that you can take to your next paper writing session. What new tip did you learn today? I think one of the most important things I learnt whilst in my first year of university was the importance of citing. For my degree, we have to follow certain rules for citing work within our papers and there’s usually a small number of marks dedicated to citing correctly in the marking rubric. It’s so easy to improve your grade just by citing correctly! I’m definitely going to be bookmarking this page! Thanks Amanda!! I work as an English Tutor at my college–basically I just edit student papers and help them improve and I wish I could just give all of them this post, these are all so true! Such a nice post, I really enjoyed your thoughts and liked the way you have shared your message to your audience. These mistakes are really true and students are usually doing that sort of mistakes in their college life that cost them poor marks and grades in their academic results. Yes, my bagel obsession borders on the insane and my husband was forced to learn how to make them to shut me up. When we go back to New York I stock up on several dozen, having perfected a method of slicing and freezing them a few days before coming back.